Time for another great offer for you to promote! 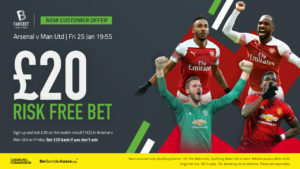 This Friday, the 25th of January, we are offering all new players from the UK a £20 risk free bet on Arsenal v Man United. Sign up and bet £20 on the match result (1X2 FT) on Arsenal v Man Utd this Friday. Get £20 back if you don’t win. 3. Refunds are issued Saturday, 26 Jan 12:00. No wagering requirement. Sign up and bet £20 or more on the match result (1X2 FT) in Arsenal v Manchester United. Deadline: Friday, 25 January 19:55. If you don’t win, £20 will be refunded Saturday, 26 January 12:00. Only players who signed up after 21 January 2019, are eligible.